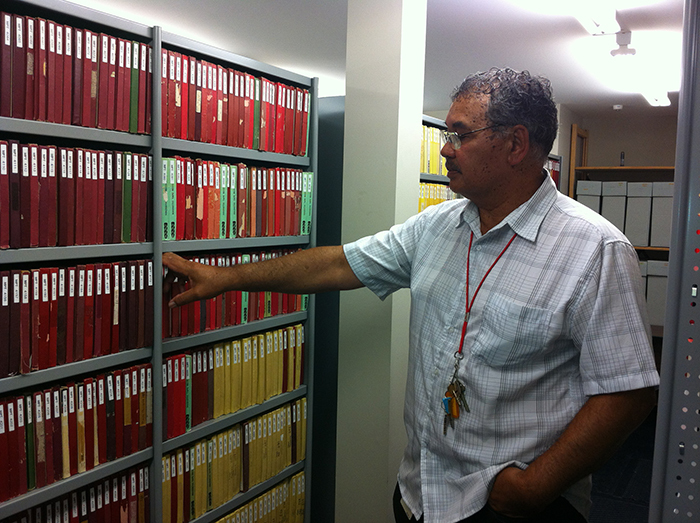 Jim Hunia, Ngā Taonga Sound & Vision’s Auckland-based Kaiwhakauka: Audio Conservator, has recently completed an audio migration project, which he first started working on back in 1999. Because of changes in audio technologies available he has seen the project through two phases: firstly migration of discs, reels and cassettes to CD, and later migration of digital files to server. So he is getting to know the material well! Changes in recording and storage technologies present both opportunities and challenges for audiovisual archivists, who for preservation purposes must work with multiple versions of a given title on different formats. He tells us about it below. Jim checks out a tape. In 1999 I walked into my new workspace at Sound Archives Ngā Taonga Kōrero (as the sound collection of Ngā Taonga Sound & Vision was then known), and what did I see? Rolling shelves, drawers, and boxes stacked with audio. Heaps and heaps of them. There were around twelve thousand audio objects waiting for my attention: reels, DATs (digital audio tapes), cassettes, and discs. Boxes of blank CDRs started arriving to copy the audio onto, with marketing blurbs claiming “these will be good for two hundred years”… Yeah right! Back in 1999 the only decent digital converter I had was inside my Sony DAT player/recorder. So… my process was to record the analog to DAT, and then copy to CDR. I had two DAT machines – so while one was recording, the previous was burning. I had my speakers split so I was listening to two different programmes at once – many in Te Reo – and it started to sound double Dutch to me. My workspace at the time was down in a room facing the Radio Network carpark. There was only myself and car exhaust fumes – so no problems with annoying anyone with loud speakers. Actually, I’m still on my own with no one to annoy in my current office (I am the only Ngā Taonga Sound & Vision audio archivist based in Auckland), but at least there are no exhaust fumes now! Eight years later, 10,000 bits of audio were now on 9,588 CDRs. But another five years later I started to notice that some of CDRs were no longer able to play back – and this was becoming more frequent. Surely 200 years are not up? By 2013 I had a flash A/D converter. An Australian audio consultant recommended I preserve all of the audio again using “Modern Best Practices.” So start at tape number 0001 (you heard right, back to number one), and still at real-time, it should take about… eight years. “Maybe I can do two at once?” I thought. Anyway, I started again. In 2014 there was a kōrero with experts and we identified that, in this particular case, the information was the significant feature we needed, not the high spec 24bit 96 kHz characteristics of the audio. Cool. So, using four high speed drives, I copied all of the CDRs to a drive, which only took one year. All 9,588 CDRs, needing four terabytes of storage, have now been safely transferred to our Digital Storage Area at Ngā Taonga Sound & Vision Christchurch, while the original materials are stored in the vaults. Project completed (for now…)! ← Audio Curios: Happy 102nd Birthday!